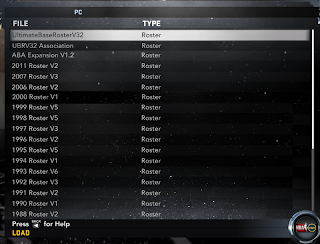 • Current NBA Teams Rosters/Rotations up to date as of Monday November 12th, 2012. • Includes a "UBRV33 Association.ros" roster file which strips out all of the retro teams for those of you who just want the updated roster with flawless Season/Franchise mode. Don't worry the normal Ultimate Base Roster V33 with all the retros is still there too. Additional Info: Included in this 4-Part UltimateNBA2K12 Mod Pack will be the latest versions of the Ultimate Base Roster, 1988 Mod, 1990 Mod, 1991 Mod, 1992 Mod, 1993 Mod, 1994 Mod, 1995 Mod, 1996 Mod, 1997 Mod, 1998 Mod, 1999 Mod, 2000 Mod, 2006 Mod, 2007 Mod, 2011 Mod, and all the graphics and art files that go along with them. Additionally, this 4-Part pack will include all Expansion Team files (made by Sevin0Seven), all ABA files/teams (made by Chrisbrodbeck), and Draft Classes. 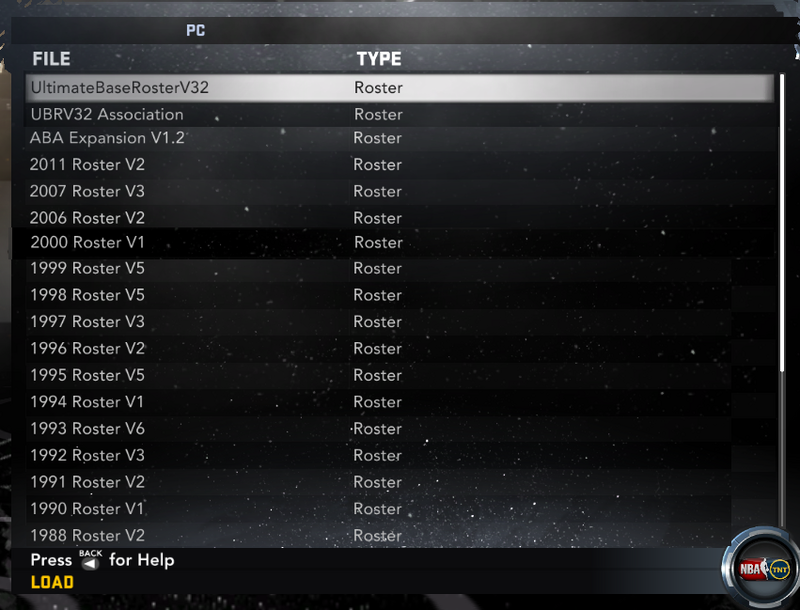 None of these files will overwrite any regular NBA2K12 files and no files will conflict with each other. After downloading each part read the "README.PDF" file for installation directions. After downloading and installing Part 1 and Part 2 you will NEVER need to download them again. Part 3 and Part 4 will be the only parts containing future updates for the Ultimate Base Roster and Season Mods. This should cut down significantly on downloading time. Note: Once you download and install Part 1 and Part 2 you will never have to download them again. These parts contain crucial files for the Ultimate Base Roster, ABA Mod, 1988 Season Mod, 1990 Season Mod, 1991 Season Mod, 1992 Season Mod, 1993 Season Mod, 1994 Season Mod, 1995 Season Mod, 1996 Season Mod, 1997 Mod, 1998 Season Mod, 1999 Season Mod, 2000 Season Mod, 2006 Season Mod, 2007 Season Mod, and 2011 Season Mod to work correctly. These parts will NEVER be updated. However, it's extremely important that you download them and install their contents into the Main NBA2K Folder one time. Further directions for installing Parts 1 and 2 are located in each individual zip file by locating and reading the "README.PDF" file. Remember, after one download you NEVER need to download these parts ever again! Anytime there is an update to the Ultimate Base Roster, any of the Season Mods, any of the Draft Classes, or any of the Expansion Teams you will need to download Part 3 and Part 4. Part 3 will contain any newly added or created graphics updated such as new cyberfaces, courts, jerseys, portraits, or logos and should be placed in the Main NBA2K12 folder. Part 4 will contain the updated roster (.ROS) files, draft class (.FDC) files, or expansion team (.TMM) files and should be placed in the SAVES folder. These two parts will always be fairly small in size because we now have the "one-time download" links for Part 1 and Part 2. After downloading please locate the "README.PDF" file for detailed installation instructions for each part.